When a young child’s own imagination takes off it is great fun to watch them as they begin to play in a world of their own. 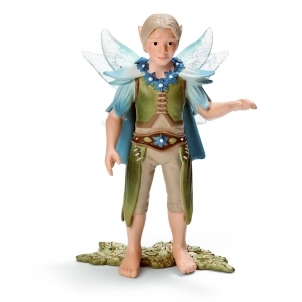 Schleich produce some wonderful quality fairies and elves that a child can spend hours playing with and can stay with them as a memory of a happy childhood family life. Toys & Learning have the Best Schleich Toys for Your Child. 100% Choice – 100% Fast Service – 100% Sale Prices. For 2012 something magical is about to happen in Bayala. New children's elves, fantasy animals, horses and unicorns are joining the mystical world from Schleich and encouraging the imagination of children everywhere. Meet my three new friends that have come to live with my three and I. They're very small but very friendly, lets say hi. Here's Schleich Lily Like Elf, who sounds like a girl, looks like a girl, but isn't. This is a little fellow who skips across the water and is almost impossible to see. 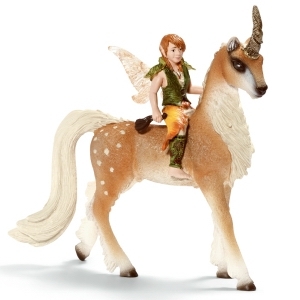 Meet Schleich Male Elf on his Forest Unicorn. He's quite dapper this fellow - and the unicorn would look like a cross between a fallow deer and a palamino horse - except for the horn. Last but not least I have Schleich Fine Daffodil Elf. Daffodils and elves seem perfectly in balance - this lovely elfette comes with a shock of ginger hair and clutches her very own story book. All three now live happily in Lily's Land, well her bedroom at least. She's loving the imaginary world that she's created, she has so many ideas about what Bayala would be like. It's great to hear her making up stories and playing by herself with her new little friends. 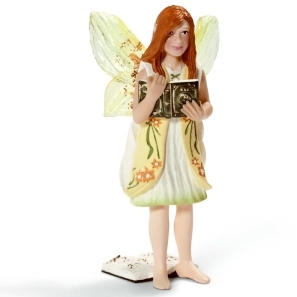 All the Schleich Fairies are very sweet, very lovable little characters. If your little ones like make believe then these are perfect. They're great for getting every child's imagination running in over drive. Lily gives her new Magical friends a lovely 4/5 the only thing she wants now is a big castle to put them in, she does make me laugh.